The aim of this study was to evaluate the incidence of dental anomalies in the permanent dentition of individuals with Down Syndrome (DS) to increase the knowledge on the dental issues in this syndrome. One hundred and five panoramic X-rays of patients with DS (61 males and 44 females), aged 7 to 42 years were used. The data were statistically analyzed using bivariate analyses test (p <0.05). Dental anomalies were observed in 50.47% of the sample. More than one anomaly was observed in 9.52% of the individuals. 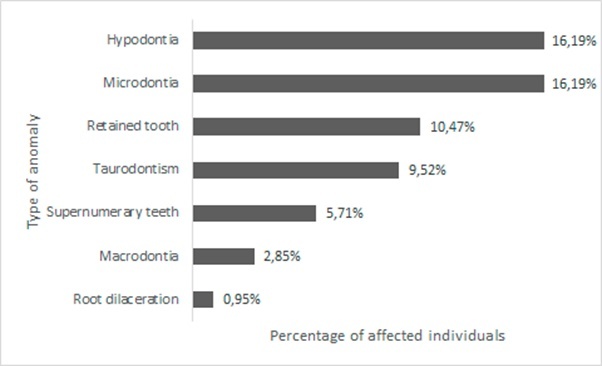 The most frequent dental anomalies were hypodontia and microdontia (16.19%), followed by retained tooth (10.47%), taurodontism (9.52%), supernumerary teeth (5.71%), macrodontia (2.85%) and root dilaceration (0.95%). There was no statistically significant difference between genders for any of the anomalies. A high prevalence of dental anomalies was observed in individuals with DS. The results of the present study reinforce the importance of good dental care, offering a greater basis for professionals who provide dental service to these patients. Keywords: Dental Care, Disabled Persons, Down Syndrome, Panoramic radiograph, Permanent dentition, Tooth Anomalies. Individuals with Down syndrome (DS) present one extra copy of chromosome 21 in their cells . This syndrome, also known as trisomy 21, is a genetic alteration with an estimated incidence of 1 in 1000 births . The phenotypic characteristics of individuals with DS are quite well-known, and some are particularly interesting in dentistry. Underdevelopment of the midfacial region, alteration of tongue size and positioning, Class III malocclusion, anterior open bite, fissured tongue, delayed eruption of dentition, small maxilla and higher incidence of periodontal disease [3, 4] can be emphasized. Studies have also reported a high prevalence of dental anomalies in individuals with DS. Some studies show divergences regarding the most frequently observed anomalies [5, 6]. Others aimed at investigating specific types of dental anomalies in individuals with DS only [7-17]. Dental anomalies may have clinical implications, both in aesthetic and functional aspects . The higher inclusion of persons with DS in the community, thanks to social, scientific and education advancements as well as increased life expectancy has increased the chances of dental practitioners to treat these patients . Thus, awareness of the dental characteristics associated with DS is fundamental to improve the quality of the dental service delivered to these patients. In addition, the early diagnosis of a dental anomaly can alert the professional to the possible development of other associated anomalies, in the same patient or in relatives . The purpose of this study was to evaluate the incidence of dental anomalies in the permanent dentition of individuals with DS aiming to increase the knowledge on the dental issues of bearers of this syndrome. The study was approved by the Research Ethics Committee of the School of Dentistry of Araçatuba (CAAE: 31157614.1.0000.5420 - FOA/UNESP, Sao Paulo State University “Julio de Mesquita Filho”). A sample of 105 good-quality panoramic X-rays, belonging to the records of patients with DS attended at the Center for Dental Assistance to Disabled Persons (CAOE - FOA/UNESP, Araçatuba, SP, Brazil) were used. Dental anomalies present in the International Classification of Diseases were investigated (ICD-10, K00 and K01) . The X-rays were evaluated by two trained examiners, in a darkened room and with the use of a negatoscope. The presence of dental anomalies was investigated only in permanent teeth. Hypodontia only was considered when a permanent tooth was missing and his predecessor deciduous was present. Suspected cases of hypodontia were not considered. The data were organized in a Microsoft Office Excel (Microsoft Corporation, Redmond, WA, USA) spreadsheet and analyzed with the use of the Statistical Package for the Social Sciences software (version 15.0; SPSS Inc., Chicago, IL, USA). Descriptive statistical analyses were performed in addition to bivariate analyses. Chi-Square test was used to verify the association between genders and the observed dental anomalies. Kappa coefficient was used to assess intra- and inter-examiner agreement. The significance level of 5% was adopted. Intra-examiner analysis showed kappa coefficient of 0.999. The result of the interexaminer analysis was 0.998. These results indicate very good intra and inter-examiner agreement. Of the 105 evaluated patients, 61 (58%) were male and 44 (42%) were female. The mean age of patients at the moment of X-ray was 16.22 years, ranging between 7 and 42 years. Table 1 shows the number of anomalies observed per individual. Table 1. Number of observed anomalies per individual. Of the total, 52 (49.53%) individuals presented no anomalies, whereas some type of anomaly was observed in 53 (50.47%) individuals. More than one anomaly was identified in 10 (9.52%) individuals. The most frequent dental anomalies were hypodontia and microdontia, which occurred in 17 (16.19%) patients. Other anomalies were retained teeth (n=11; 10.47%), taurodontism (n=10; 9.52%), supernumerary teeth (n=6; 5.71%), macrodontia (n=3; 2.85%) and root dilaceration (n=1; 0.95%) (Fig. 1). Fig. (1). Frequency of observed teeth anomalies. The distribution of anomalies according to gender is shown in Table 2. There was no statistically significant difference between genders for any of the observed anomalies (p > 0.05). Table 2. Distribution of anomalies according to gender. This study aimed at evaluating the prevalence of dental anomalies in the permanent dentition of individuals with DS, in order to increase the knowledge on the characteristics of interest to dentistry observed in these patients, aiming to improve the quality of the delivered service. Radiographic analysis was used as methodology; therefore only anomalies that can be radiographically detected were listed. The prevalence of dental anomalies in Brazilian subjects with DS has been already studied by Moraes et al. , however the sample used by the authors was considerably smaller than the sample evaluated in the present research. The authors investigated the presence of dental anomalies in both the primary and permanent dentition of individuals with DS, through the evaluation of panoramic radiographs. They observed a high incidence of dental anomalies in the studied sample, and several patients had more than one associated anomaly. The most observed anomalies were taurodontism and hypodontia, but the authors also found conic teeth, retained teeth, root dilaceration, fusion, microdontia and delayed tooth formation and eruption. The results revealed a high prevalence of dental anomalies, corroborating the results of previous studies [5-17]. The most frequent anomalies were hypodontia and microdontia. Somani et al. also reported a high prevalence of microdontia in individuals with DS, whereas the high prevalence of hypodontia was observed in the studies of Kumasaka et al. , Mestrovic et al. , Shapira et al. , Acerbi et al. , Lomholt et al. , Moraes et al. , Reuland-Bosma et al. , Suri et al. and Sekerci et al. . Impaction or retained tooth was also frequent in the studies of Moraes et al. , Somani et al. and Sekerci et al. . High prevalence of taurodontism was reported by Bell et al. , Alpöz and Eronat , Rajic and Mestrovic , Moraes et al. , Shapira et al. and Sekerci et al. . In the present study, taurodontism was also among the observed dental anomalies, however at a relatively lower frequency than the previously reported results. Although dental anomalies, especially microdontia, taurodontism and macrodontia, have been observed more frequently in males than in females, there was no statistically significant difference between gender for any of the observed anomalies, corroborating the results of Kumasaka et al. , Lomholt et al. and Sekerci et al. . Hypodontia and retained teeth were more frequent in females. Suri et al. also observed that hypodontia was more prevalent and severe in females than in males with DS. Shapira et al. reported that the high prevalence of dental anomalies in individuals with DS must not be considered as an isolated phenomenon, but as part of a set of genetically determined features, possibly associated with the slow cellular growth rhythm and consequent reduction in the number of cells. In addition, Neville et al. emphasized that the genetic factor seems to exert a strong influence on teeth development, as a great number of inherited syndromes was associated with hypodontia, including DS. The authors also mentioned the role of genetics and the relation between DS and microdontia and taurodontism. Regarding taurodontism, it was highlighted that chromosomal abnormalities may influence teeth shape and that taurodontism is not a result of a specific genetic anomaly, it is associated with a great number of genetic alterations. According to Bell et al. taurodontism is among the countless characteristics of individuals with DS resulting from the reduced mitotic activity in developing tooth germs. Dental anomalies may have different clinical implications, both in the esthetic and functional aspect. Cases of hypodontia can apply for prosthetic rehabilitation, with or without installation of osseointegrated implants. Supernumerary teeth may lead to displacement of adjacent teeth and to crowding as well as other types of malocclusions. Impacted teeth may cause root resorption of the adjacent teeth as well as development of cysts and tumors. Cases of micro and macrodontia may require esthetic treatments aiming at reanatomization. Taurodontism and root dilaceration may cause complications if endodontic treatment is necessary. In addition, dilaceration can bring in surgical complications, when exodontia is needed . Having in mind the clinical importance of the dental anomalies and the high prevalence of this condition in individuals with DS, the necessity of dental follow-up in these patients must be reinforced, both for professionals and for caregivers. Moreover, it is essential that this subject is further explored, in order to provide greater scientific basis for dental practitioners and to improve the treatment delivered to these individuals. The existing divergences between the results of previous studies suggest further investigation on the subject, possibly including analysis of larger samples. There was a high prevalence of dental anomalies in the permanent dentition of the evaluated individuals with DS. The most commonly observed dental anomalies were hypodontia and microdontia. Statistically significant differences did not occur between genders for any of the observed anomalies. Brunoni D. Aspectos epidemiológicos e genéticos. In: Schwartzman JS (Org). Síndrome de Down: São Paulo, Mackenzie 1999; pp. 32-43. Shin M, Besser LM, Kucik JE, Lu C, Siffel C, Correa A. Prevalence of Down syndrome among children and adolescents in 10 regions of the United States. Pediatrics 2009; 124(6): 1565-71. Varellis ML. Pacientes com necessidades especiais na Odontologia: manual prático. 1th ed. São Paulo: Santos 2005. Elias R. Odontologia para pacientes com necessidades especiais: uma visão clínica. Rio de Janeiro: Revinter 2007.
 de Moraes ME, de Moraes LC, Dotto GN, Dotto PP, dos Santos LR. Dental anomalies in patients with down syndrome. Braz Dent J 2007; 18(4): 346-50. Sekerci AE, Cantekin K, Aydinbelge M, Ucar FI. Prevalence of dental anomalies in the permanent dentition of children with down syndrome. J Dent Child (Chic) 2014; 81(2): 78-83. Bell J, Civil CR, Townsend GC, Brown RH. The prevalence of taurodontism in down’s syndrome. J Ment Defic Res 1989; 33(Pt 6): 467-76. Alpöz AR, Eronat C. Taurodontism in children associated with trisomy 21 syndrome. J Clin Pediatr Dent 1997; 22(1): 37-9. Kumasaka S, Miyagi A, Sakai N, Shindo J, Kashima I. Oligodontia: a radiographic comparison of subjects with down syndrome and normal subjects. Spec Care Dentist 1997; 17(4): 137-41. Rajić Z, Mestrović SR. Taurodontism in down's syndrome. Coll Antropol 1998; (22: Suppl): 63-67. Mestrović SR, Rajić Z, Papić JS. Hypodontia in patients with down's syndrome. Coll Antropol 1998; (22: Suppl): 69-72. Shapira J, Chaushu S, Becker A. Prevalence of tooth transposition, third molar agenesis, and maxillary canine impaction in individuals with down syndrome. Angle Orthod 2000; 70(4): 290-6. Acerbi AG, de Freitas C, de Magalhães MH. Prevalence of numeric anomalies in the permanent dentition of patients with down syndrome. Spec Care Dentist 2001; 21(2): 75-8. Lomholt JF, Russell BG, Stoltze K, Kjaer I. Third molar agenesis in down syndrome. Acta Odontol Scand 2002; 60(3): 151-4. Reuland-Bosma W, Reuland MC, Bronkhorst E, Phoa KH. Patterns of tooth agenesis in patients with down syndrome in relation to hypothyroidism and congenital heart disease: an aid for treatment planning. Am J Orthod Dentofacial Orthop 2010; 137(5): 584.e1-9. Somani R, Sunil MK, Jaidka S, Khaira J. Dentofacial anomalies and oral hygiene status in mentally challenged children: a survey. J Ind Acad Oral Med Radiol 2011; 23: 51-3. Suri S, Tompson BD, Atenafu E. Prevalence and patterns of permanent tooth agenesis in down syndrome and their association with craniofacial morphology. Angle Orthod 2011; 81(2): 260-9. Neville BW, Damm DD, Allen CM, Bouquot JE. Anormalidades dentárias. In: Neville BW, Damm DD, Allen CM, Bouquot JE, Eds. Patologia oral e maxillofacial. 3rd ed. Rio de Janeiro: Elsevier 2009. Garib DG, Alencar BM, Ferreira FV, Ozawa TO. Anomalias dentárias associadas: o ortodontista decodificando a genética que rege os distúrbios de desenvolvimento dentário. Dental Press J Orthod 2010; 15: 138-57. World Health Organization – WHO. International Statistical Classification of Diseases and Related Health Problems 10th Revision. ICD-10 Version: 2016. Available from: http://apps.who.int/classifications/icd10/browse/2016/en [Accessed on 7th June, 2016].